Let’s take a specific example of what I was talking about in the last post in this series to show you what a Relationship Marketing Strategy looks like in action. I have stated, for example, in this interview, that email is both taking credit for sales that would have happened anyway and generating more sales than you think it is. These statements are both accurate at the same time. When you use Control Groups to measure the incremental behavior generated by e-mail campaigns, what you find is both effects occur at the same time but each one happens with a completely different behavioral segment – Engaged versus dis-Engaging. Unfortunately, in most cases, the net effect is e-mail falsely takes credit for more sales than it doesn’t get credited with accurately, because the Potential Value (likelihood to buy) of the Engaged is far greater than that of the dis-Engaging. 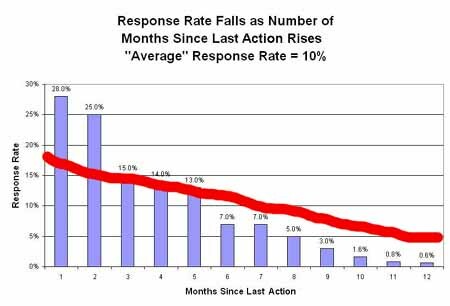 Against a graph of Response by how long ago the last click in an e-mail occurred, these dual effects on the actual response rate of an e-mail drop versus control group look something like this (red line). On the left we have the highly Engaged, and moving to the right, the pattern of dis-Engagement. On the left, we have a much higher percentage of “would have bought anyway”, which decreases as we move to the right. The portion of the blue bars above the red line represent buying activity in the control group – they bought without receiving an e-mail. As we move to the right, this effect decreases, until the blue bars are now below the red line. 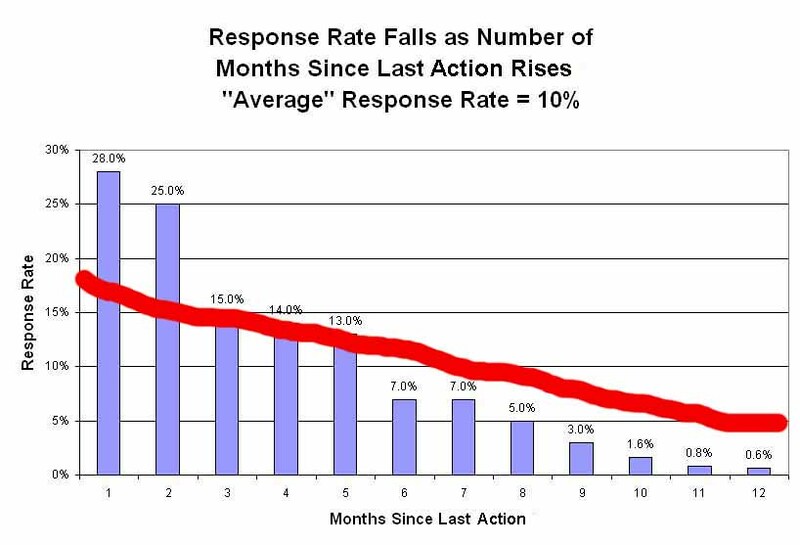 The space between the blue bar and the red line represents sales made because of your e-mail that were not tracked back to the e-mail drop. Often, this is a result of simply not tracking the “campaign tail” for long enough, which is difficult to do without using a Control Group to find the long-term lift. The implication: for commerce, you should be sending a different message to these different behavioral segments depending on where they are in the LifeCycle if you want to maximize profit. In the segments with highest likelihood to buy, you should take it easy on the discounts; one way to optimize commerce profit across the entire engagement spectrum is to use a Discount Ladder. For all other business models, it’s highly likely that you could benefit from the same approach, if you have clear value KPI’s and understand this dis-Engagement process. Now, I am well aware the above sounds insane to offline retail folks. Most if not all of you lack the data to measure these effects, but that doesn’t mean they don’t exist. For the folks that do have the data, the day will come. Hey the web is interactive, the web is different, right? Well, yes it is, so why measure the effect of promotions like they do offline if you have a superior method of optimizing for profit? When a visitor / customer is highly Engaged, they often generate visits or sales without needing any Marketing at all. That’s what the Relationship Marketing Strategy is all about – the Relationship drives the business. That’s why, for example, people have found that including a lot of relevant and customer-focused content in a commerce newsletter gets higher response rates than just sending people coupons. It’s why creating a new customer kit drives higher repeat purchase rates – it’s the Relationship building. And that’s why you will find (if you use Control Groups) that for the highly Engaged, your e-mail program is taking credit for sales it did not generate, and that if you are providing discounts to the highly Engaged, you are probably wasting money on them. A portion of the Engaged segment would have bought anyway, and the fact that you dropped a coupon in their lap with e-mail is simply coincidence. Or, if you send a coupon every week on the same day, the customer simply waited for the coupon they knew they were going to get so they could make a discounted purchase they would have made anyway at full margin. That’s how e-mail takes credit for sales it does not generate, and anybody who is managing to ROI / profit should care deeply about this. Now, if you’re a “share” thinker, this subsidy cost related to “would have bought anyway” doesn’t matter to you, because any sale the other guy didn’t make is a good sale. But last time I looked, you can’t put share in a bank account, and the logical extension of this share mindset is you can get 100% share by selling product below cost, so I have never understood it. If your directive is increasing gross sales, that’s pretty much the same thing – you get there by unproductive ad spending, which in the end is the same thing to the bottom line as selling product below cost. By the way, I’m not saying the Engaged should receive no communications, but they should get a different kind of communications tailored to their behavioral state. On the flip side, no matter what your directive, you should care about not getting credit for sales your e-mail generated. E-mail to another segment, those in the process of dis-Engaging, almost certainly generates sales you are not tracking and not crediting to e-mail. And that’s because the dis-Engaging are changing their behavior with the company for some reason. They are seeking alternate channels, for example. In other words, they are responding to your e-mail but they are not responding through your e-mail, they are not using whatever devices or links you give them in the e-mail but are still making a purchase because of the e-mail. Again, you don’t see this unless you use Control Groups. A third segment, the dis-Engaged, doesn’t respond to your e-mails at all. And they’re not going to, because your company is now irrelevant to them. The company has not been tracking the dis-Engagement process so it didn’t take any specialized action to slow or stop the dis-Engagement. In fact, the company is probably just damaging their Brand by sending these folks any e-mail at all. This is Relationship Marketing Strategy; it completely redefines how you communicate with customers based on where they are in the Engagement / dis-Engagement cycle. And it works amazingly well. The bottom line is customers remain customers longer – this Strategy tends to extend the LifeCycle – with the result customers end up with higher LifeTime Value. Are you surprised? You shouldn’t be. People talk about this incessantly on the web all the time, don’t they? Relevance? Customer centricity? Customer experience? Blah blah blah? Then how come so few people are using a Relationship Marketing Strategy? How come so few are using Control Groups to measure the true net influence of e-mail? Why are people blasting out the same irrelevant message to all their customers once a week? A lot of talk and very little action, methinks. Perhaps you just needed a framework to put everything into perspective, a roadmap to getting it done? Now, I realize many folks in the community don’t have the tools they need to measure dis-Engagement; typically only the high-end tools have metrics like Recency and Latency and even though Google Analytics tracks Recency, it isn’t easy to do much actionable segmentation for that metric in the tool. There’s a very simple reason for this, if you think about it – it’s a lot harder to measure something that doesn’t happen than measure something that does happen. After all, servers are all about requests, they’re not really thinking about “did not request”, if you know what I mean. That job takes a database that’s remembering the last date a request was made forward in time, and calculating “did not request”. That capability is a lot more expensive, at least for now. But, I hope the “tool problem” doesn’t mean the community will ignore the concept of dis-Engagement while screaming to the skies about how important Engagement is to measure. Those of you with access to a transactional database don’t have to wait for web analytics tools, you can profile customers for Engagement and the dis-Engagement process right in the transactional database with a simple query tool. And I hope you now have a Strategic framework to think about why dis-Engagement is so important, at least from a Marketing perspective, so when you get your hands on that high-end tool, you will know exactly what to do with it. If you really take some time to think about the ramifications of the Relationship Marketing Strategy that Engagement is a Tactical part of, you just might come to believe that dis-Engagement is even more important to measure than Engagement. To summarize this series, the idea of Engagement, and a lot of notions surrounding it – customer centricity, relevance, and customer experience – are concepts within a Marketing Strategy known as Relationship Marketing that tosses out calendar-based communications in favor of communications based on the customer’s relationship with the company. The ability to do this depends on an understanding of the Customer LifeCycle, the results of each interaction between the customer and the company over time. The LifeCycle is tracked using various Engagement metrics, including dis-Engagement, which typically is the first sign of a problem with the customer Relationship. If your company is having trouble understanding why Engagement is important to measure, perhaps it’s because senior management lacks the context of the Customer LifeCycle for taking action and the strategy of Relationship Marketing as a game plan. Maybe you should send a link to the Wikipedia definition of Relationship Marketing to the CMO or CEO and ask, “Is this what you want? Because if you do want this, I know how to measure the success of it”. Questions or comments on e-mail engagement and response? Have you ever heard of the strategy called Relationship Marketing?